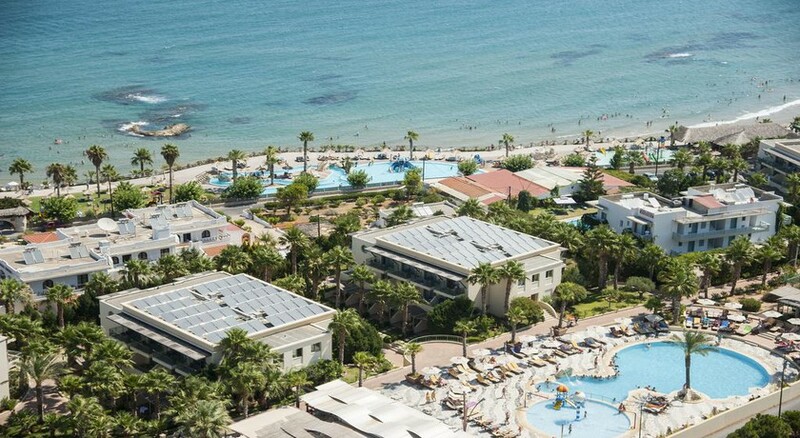 Located on the island paradise of Crete, the Star Beach Village Hotel & Waterpark sits in the lively resort of Hersonissos, right next to the Star Beach Water Park. Children get their own playground, a pool complex where they can have fun on waterslides, while adults can indulge several sports and just soak up the sun on the beach or by the pool. It’s a great hotel for families and couples looking for a beach holiday, with local taverns, shops and nightlife close by. The hotel’s 188 apartments come with stunning sea views. If you're looking for authentic Cretan cuisine, you'll find it at the hotel's Minos restaurant, while the snack bar serves you nibbles and drinks by the poolside. Star Beach Village Hotel & Waterpark is perfectly located for you to explore other sun-soaked beaches and charming villages in Hersonissos. The Star Beach Village Hotel & Waterpark sits just 50 m from a sandy beach in the resort of Hersonissos. From here, you can easily discover gorgeous beaches and sleepy villages along with lively nightlife and attractions in Hersonissos. The resort consists of 188 comfortable studio, one bedroom and superior one bedroom apartments, including a living area and surrounded by beautifully landscaped grounds and offering spectacular views of the sea. There are plenty of dining options, including the main Minos restaurant that serves authentic Cretan cuisine, a lobby bar and pool snack bar. Enjoy a swim in the resort’s freshwater swimming pool, which has a children's corner, unwind in a Jacuzzi and soak up the rays on sun loungers and parasols. There’s a Fitness Room, too, located next to the pool. Families can also indulge in some mini football and basketball or take the shuttle to the Crete Golf Club. The spa comes with expert masseurs and beauticians, offering hydro massages, aromatherapy, algae therapy, body wraps and facials. Kids can stay entertained with the Mini Club on the premises. Don't forget the Star Beach Water Park next door, with loads of rides, slides and waters sports for the whole family! In the evenings, the hotel hosts animation shows, Cretan folklore nights and live dancers. A 10-minute walk from Hersonissos’ main road, offering a variety of shops, bars and restaurants. Heraklion Airport is 25 km away. The small villages of Koutouloufari, Piscopiano and Old Hersonissos are within walking distance, while Stalis, Malia, Sissi, Anissara, Potamies, Avdou and Kera are a drive away. My family had a fantastic time at Star beach.